the MyPal A639 GPS PDA provides ample space for GPS maps and digital multimedia contents. 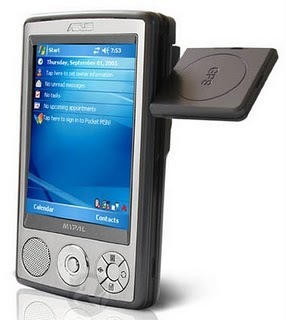 The all-new handheld device also incorporated advanced wireless connectivity, including GPS, Wi-Fi and Bluetooth v2.0, to provide total wireless freedom. With 1GB built-in storage capacity and SD card reader, the MyPal A639 offers ample storage capacity for GPS maps of various cities, videos, MP3 music, photos and more. For those who are always on the go, the MyPal A639 is perfect for bringing along large, complex files. The MyPal A639 is ideal for navigation during road trips, wireless networking and convenient data transfers without wire constraints. GPS - With GPS navigation technology, large storage capacity for maps and swivel patch antenna to ensure quality satellite signal reception, the MyPal A639 is an excellent road companion. WLAN 802.11b+g - The MyPal A639 supports 802.11b+g standards, enabling high-speed wireless networking for easy Internet access and file sharing with other devices within the WLAN. Since different travelers and drivers have different viewing habits, the swivel design allows the antenna to always remain parallel to the sky whether in portrait or landscape viewing modes for best signal quality. The patch antenna offers larger surface area compared with conventional designs for excellent reception as well.